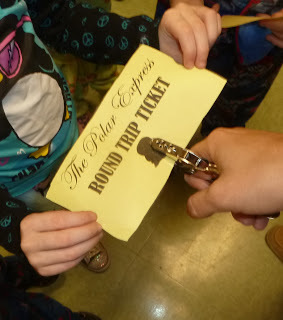 Polar Express Day was a blast! 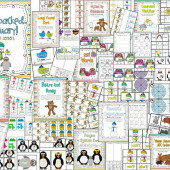 If you are planning yours soon I am going to take you through our day and show you what we used. Then I would love to hear what you do so I can add to it next year! Please share! First of all what could be more fun then wearing your pajamas to school?!? But the Polar Expressing started at 9! They cut out their tickets and got in line to board the “train”. The train was just their chairs in little sets of 2 on the rug. I was the official hole puncher and they LOVED my flair. We are all on board now with our tickets. Time for the Story! This month, Barnes and Nobles is featuring The Polar Express as their free read aloud. The author Chris Van Allsburg is narrating. Here’s the Link or you can read it yourself with all YOUR dramatic flair. We did a couple little activities but barely had time for much with our working morning. This is what we did: We used Pitner’s Sequencing Freebie and then I found a maze and a word search on the Polar Express Website that were also free. We had hot cocoa like the kids on the train. (only cost me 7 dollars for all this!) 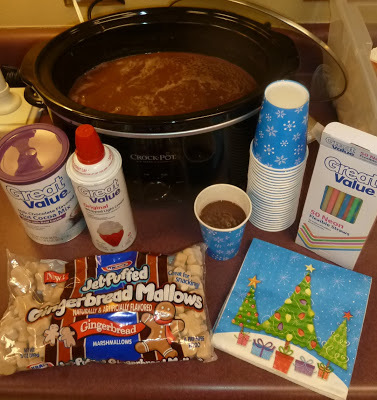 Just put water in your crockpot and dump the hot cocoa mix in…stir and keep your crock pot on warm. Perfect! We had gingerbread marshmallows because is was gingerbread week and of course we had to top it with whip cream. I forgot the candy canes at home! I was going to put one in there but we didn’t miss them at all. They were so sweet and I got lots of extra hugs today for my efforts. 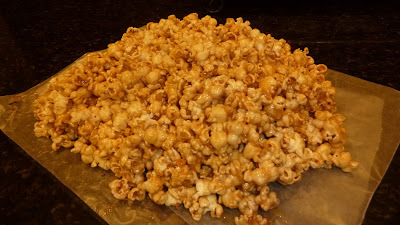 Then I came home and made THE BEST CARAMEL POPCORN IN THE UNIVERSE! Jessica from my world made by hand blogged about it and I had all the ingredients in my pantry…so it was only a matter of time!!!! My husband is going to flip out when he gets home from the gym! It’s his favorite treat! awww…what a nice and memorable day for your kids! I love this! yum! 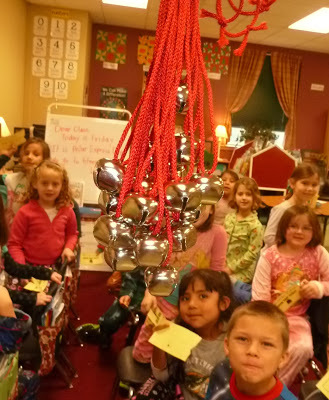 we are doing our polar express day the last day before break – and we're having nachos too! lol..I know – weird. but it's tied to their A.R. goals and I wanted to do it before I left for maternity leave. BUT I also just saw this idea for a North Pole Float!!! umm…TOTALLY doing it! It's vanilla ice cream with gingerale (so it stays white), and you can add red or green sugar crystal thingies on top if you want… yum! wait – I think I have all that now…here I go to check that out! haha! Looks like they had loads of fun! 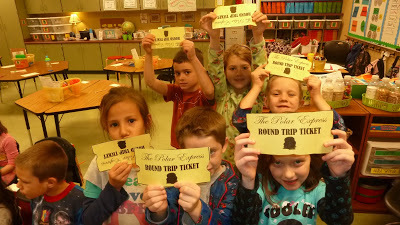 We are having our Polar Express Day next week. I love the idea of making the Hot Chocolate in the crock pot!!! I'm so glad you shared. I'm totally doing that! I like to put the bells in the freezer for a while and then get the office to say their is a special delivery. Love the north pole float ! This is what school is all about!!!! The kids don't remember anything we teach them! They remember these fun event sand activities! Wish I was your student that day! Yum! I made Jessica's popcorn recipe too and it turned out soooo great! OK, now I want some of that tasty temptation!!! YUM. I have to hop over to Jessica's next. 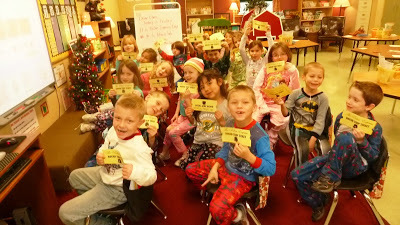 Our Polar Express day is this week – PJs and all! The year Joshua was in 1st we actually went in school bus "trains" to see it at the movie theater! 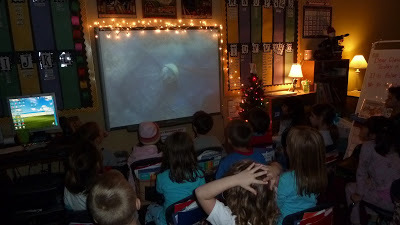 That next year we got a big screen in our cafeteria with surround sound, so now the firsties all go in there together for their Polar Express ride. 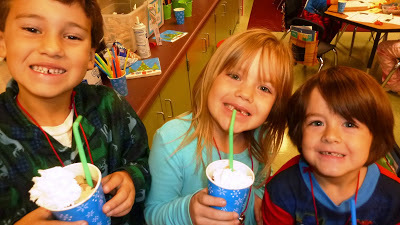 They also enjoy their hot chocolate and popcorn as a grade level in there. 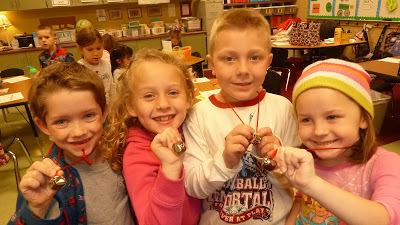 The teachers put their bells in the freezer so that when the package from the North Pole is delivered later that day they're cold to the touch. It's so magical!!! The Santa letters are in there, too. One year I got to write them because my favorite teacher asked me to do it and it was great fun to personalize each one. Believe!!! Thanks for making that day so special for those little angels. I so very much love this idea. 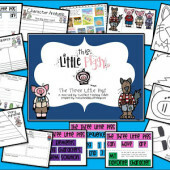 I wonder if I can pull it together by Friday. . .I have great parent help. . .I bet I can. But do I dare? I NEED THAT POPCORN!! Looks like a great day! I can't believe I wasn't already following your blog! 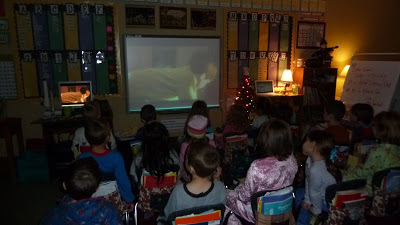 I love your Polar Express ideas! 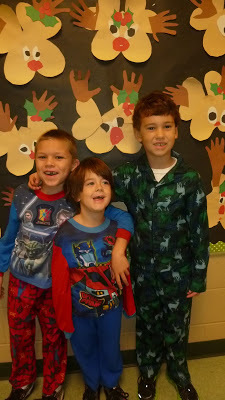 I get to have PJ day TWICE next week, since I have 3 different groups of pre-schoolers. I am definitely going to be making some tickets, using a hole punch, making a chair train, AND listening to the story read aloud! Perfect! Great ideas…I'm stealing them all!! Thanks so much for sharing. Love it! We've been celebrating for the past five years and it's been so fun! I decorate my door as the front of the train, we have a reindeer food bar where kids make food to sprinkle on their lawn, give out bells attached with a "believe" tag and I just made a packet of activities for it. This year I will have them look for rhyming pairs in the song "When Christmas Comes to Town" and then practice reading aloud for fluency work. 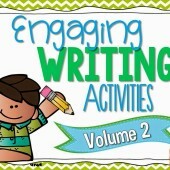 Thanks for sharing the Barnes and Noble link! Help…. how did you transfer the read aloud from your nook to a classroom screen?